Away We Happened is finally here! 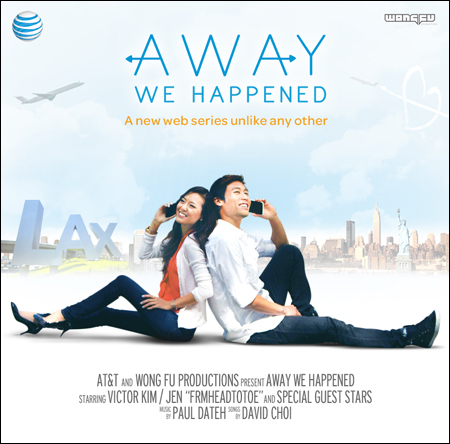 The very first episode of the project I have been working on with Wong Fu Productions and AT&T is finally up at AwayWeHappened.com. This has been a new adventure for me since this is the first time I've done any real acting (Does playing "Puck" in A Midsummer Night's Dream in high school theater count? lol.) and I am so anxious, nervous, and excited to share it with you! You guys watch the video, go to awaywehappened.com and submit your suggestions for what should happen in the next episode, and vote on which plot you like the most! Then our team is going to write, film, edit, and upload the next episode in just a few days. As of this moment, I have no second script in hand and have no idea what will happen next!!! My heart was racing so hard watching this video for the first time since it's as much of a surprise for me as it was for you. Still totally in disbelief and such an honor to be working with such talented and wonderful people. Did you enjoy it?? What do you think should happen next? Let me know down below and I'll see you guys very soon! Wow this is amazing! Can't wait to watch the next episode!!!!! I watched it as soon as it came online!!! it was amazing, cant wait for the next episode. wow that was awesome, great episode. Give us more. WOW that was wonderful, can't wait for the next episode, what a wonderful idea! Of course they should meet and I think the letter is for her ex-boyfriend, with whom she broke up with recently. this is such an interesting concept, how the audience decides. I'm hooked already! <3 Great work! I think the ex-boyfriend angle for the letter is a bit obvious, but maybe it could be for someone else, like an estranged relative. Maybe she doesn't have a good relationship with one of her parents or something. I'm really happy that you have succeed in your work and that you get opportunities like this. I really want to become great makeup artist like you ^-^ You are my rolemodel Jen! anyway I wait forward the next episode and new video from you! This is exciting that you're in a production! nice work Jen! you looked great! playing puck (and that short in the music video!) gave you good practice! This is so exciting! You were great! Can't wait to see the next episode! For a first time actress, I think that you were pretty awesome! I loved the blah blah blah scene (3:55), it was very funny. Great work done, can't wait for the next! I really like it! =) So exciting to watch this episode! :) I had a good laugh at the 'bla bla bla' and 'I NEED COFFEE!!' scene! I LOVE THE EPISODE! You are definitely an actress! Hi Jen, I think you just found another gift of your many! I really liked your acting, you should go for it! And also, you look gorgeous! The letter is for her ex-boyfriend, whom she broken up with yet and yes she should say that they should meet. I`m so excited about the newest episode! I hope you will also post it on your blog. OMG Jen! You're amazing!!!! I'm so happy for you! What a great project! I can't wait for the next episode!!!! Did you do the makeup yourself? Wow!! I loved the video!! It was soo funny! This is so exciting!!! So happy for you! What an amazing opportunity. I have no idea what the next episode should entail! But I can't wait to see it! Have a nice trip! that is so cute! i think i will become a big fan:) you are great. OMG so coool! I'm goign to watch it from now on! that's for sure! awesome stuff!! i love your hair too! wow jen! it's so great to see you involved in film! i feel like maybe there will be more representation for asian americans in films as people like you decide to get involved :) can't wait to see more of you! You were sooo good Jen! I am so happy for you! Congrats! You did a great job for a first time! wow! im hooked already! :D cant wait for the next episode..
Great job to the team...And good luck whit the project you are gourgeous!!!!!!!!!! Jen, I love the video! You did a great job! I'm so excited to see epi2! I think Jean should totally say yes to meeting in person. But I think she won't say it right away bc they'll talk all night first. That letter in the beginning is maybe a goodbye letter??? Great work! Looking beautiful! oh my goodness, i giggled the whole time! this clip is waaaayyy too adorable! :DDD i am all smiles now. why did it end there?! Jade should respond YES, and i want to know who the letter is for also. i hope the next episode doesn't take too long! :] great job, Jen! Great job, as everyone has already posted. I liked the pace of the story so far. It isn't so cutesy and cliched (as in they hate each other and then fall in love). Your character reveals little bits of herself without being too heavy handed. And, there is a vulnerability in the guy that I like. Can't wait to see what happens. Funny, when I saw your name was "Jean" all I could think of was "ExtraPetite!" lol. The styling was fantastic. You look petite, but not super small-- just very classy and stylish. Agreed that you need a tutorial on the makeup for the episode. You did so well what an interesting start to a series!! So looking forward to the next bit! You agreed to meet up at you and Daniel's meeting point. You came there, happily and anxiously, but you didn't meet him. You've waited an hour, without any notification, and Daniel's phone was off. Yo went home, feeling mad, silly and stupid of trusting people too quick, and embarrassed of the happy and anxious feeling at first. In the end, you decided to just mail out the luggage to him. it was your birthday and in the letter was your wishes for the year. You thought he would fulfill one of them. So you said yes. Jen I loved it.. i can't wait for the next episode..you guys looked great in the series.. Well done!!!! Continue doing the awesome great job!! Great!!!! Can't wait for the next episode. Continue with your awsome job! This is so cool, Jen! You're so multitalented. :) And I love the blazer you wear in the first half. Where did you get it? I took a break on reading BLOGS. I shouldn't do that. LOL. LOVE THE NEW LAYOUT to your page! LOVE episode 1. Keep um coming. Congradulations on the project. Amazing! btw, I cannot believe how tiny you look even with heels on! You agreed to meet up. But after the phone conversation, you had a second thought. And flash back of what happened with the letter. The letter was from your ex boyfriend that wanted to reconcile because both of you had a misunderstanding in the past but he patch it up. But still you are considering. Now you have to choose either a new flame or an ex flame. i should go to the website and totally vote. Hi Jen, I'm so curious about the song at scene the day after you wrote the letter. What is that song? Tried googling but doesn't work. Thanks! IT IS JUST SOOOO GREAT I CANT WAIT TO SEE THE NEXT EPISODE! WHOAH!